HIGHLAND, Ind. 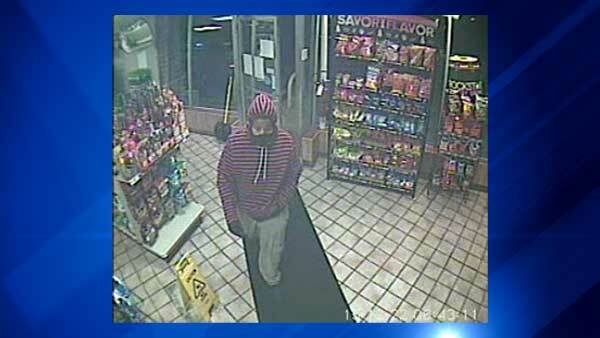 (WLS) -- Police in Highland, Indiana, are asking for the public's help to identify a man who robbed a gas station at gunpoint. Surveillance photos show a man wearing a striped hooded sweatshirt and light-colored pants walked into Witham's Sav-A-Stop in the 3200-block of 45th Street around 6:45 a.m. Tuesday. Police said the suspect walked up to the counter, pulled out a silver semiautomatic pistol and demanded all of the cash in the register. He allegedly took the money and cigarettes and got away in a dark-colored sedan, possibly a Doge or Chrysler. Anyone who can identify the suspect should call Highland police at 219-838-3184.